However, you really have to use the restroom, and after asking where it is, you discover the one toilet hasn’t been cleaned in decades, judging by the black under the rim. You vow never to return. Customers have high standards (as they should). The business world today is a very competitive environment and chances are the customer has more than one option if your business is a turn off in some way. Customers say outside of customer service, the cleanliness of the business is the next important factor for them continuing to patronize your establishment. Many businesses, especially small businesses, just don’t have the time to invest in cleaning the business themselves. Small business owners wear dozens of hats and cleaning tends to be one of the last hats put on. Putting off commercial cleaning could be a big mistake. You don’t want to start losing customers. Instead, you need to preemptively strike —by picking up the phone and calling Integrity First Professional Services in the Charlotte and Greensboro, NC, area. We specialize in office cleaning from small offices to big commercial warehouses or industrial jobs. No job is too big or too small. We value every customer and put integrity into all of our cleaning jobs. Reputation. The most important criteria in selecting a commercial cleaner is the company’s reputation. Check online reviews, get referrals from others, or even call another business owner whose business’ cleanliness impressed you or who you know and trust to make a recommendation. Integrity First Professional Services strives to do the right thing always. We do our best to exceed your expectations and always leave your business sparkling. We guarantee all of our cleaning service jobs so if you’re not satisfied for some reason, we’ll come back out for free. Contact us today for a free estimate! Schedule. When interviewing prospective commercial cleaning service companies, ask them for their availability. For example, if you own business bakery, odds are you don’t want commercial cleaners doing their job during business hours or at least during peak business hours. The commercial cleaners distract the customers; they get in the way of the customers, and seeing someone coming out of the bathroom with a toilet brush in hand and purple gloves on isn’t exactly an incentive on the buyers part to buy more pies. Make sure the commercial cleaning company can clean on your schedule — nights if need be. Training. Lots of people say they can clean. But can they? Do they have any professional training in how to properly clean? Do they know which cleaning products do what job without damaging anything? Integrity First Professional Services invests in our professional cleaning team. Each member is trained by one of the most senior members of our staff and is always accompanied on jobs in the beginning. We encourage feedback from our clients, so if a job is not up to standards, please, by all means contact us. We’ll do our best to amend the situation and make it right. Experience. This goes hand-in-hand with training. What other clients does the commercial cleaning company service in your area? Do they have an established clientele? One tell-tale sign goes back to scheduling. If they are booked, that’s a good sign the professional cleaning company’s service is valued. Standards and Integrity. This last tip encompasses all of the previous four tips. Does this commercial cleaning company have cleaning standards it adheres to? Are these standards in writing? Is immaculate cleaning the goal? Safety and hygiene must take priority in all jobs, especially if the establishment is a healthcare facility of some type like a doctor’s office, dental practice, or a hospital. And let’s not forget schools, daycares, and churches. All of these places harbor germs, and none of us enjoy being sick. The job of a commercial cleaning company is just that —to clean. To rid the business of germs that threaten our health. To kill them before they kill us. To leave the surface shining and easy to navigate. 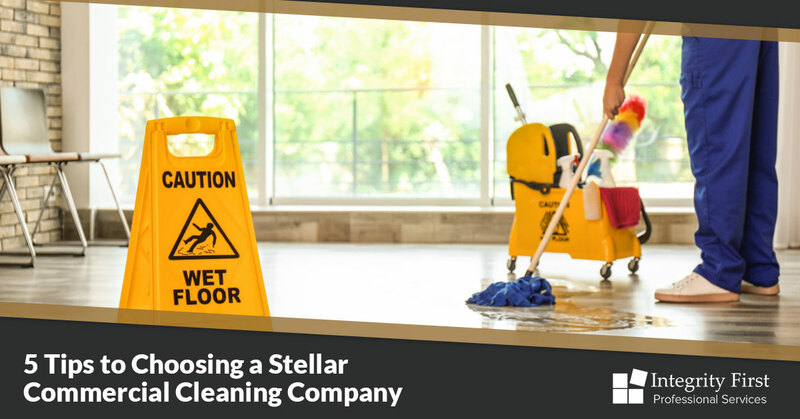 A commercial cleaning company’s other main job is to make its clients’ lives easier, so the company can focus on what it does best. A clean environment, decluttered and devoid of trash, makes the commercial business a place where you, and everyone who works in that business, want to spend time. It improves employees’ morale and productivity. It improves our environment in some small way. Integrity First Professional Services has been in business for over 40 years. We have the experience to do the job right, the properly trained professional cleaners to handle any job, and the integrity and standards that are hallmarks of our business. We work with your schedule to clean your office, industrial warehouse, or apartment complex. Finally, our reputation speaks for itself. As one of the top cleaning company in the Charlotte and Greensboro, NC, area, Integrity First Professional Services puts you first. Contact us for a custom quote today!